Guercino was one of the foremost painters of the seventeenth century. This recently rediscovered work dates from the artist’s early, rarest, and most desirable period, when he was acclaimed for the emotional power of his compositions, with lifelike figures intensified by a rich palette and strong effects of light. Guercino depicts an episode from the Gospel of John (4:5–42). Jesus, traveling through Samaria, sat down to rest beside Jacob’s well. A woman came to draw water, and he asked her for a drink. She expressed her surprise that a Jew would even speak to a Samaritan, to which Jesus replied: “Everyone who drinks of this water will thirst again, but whoever drinks of the water that I shall give him will never thirst.” Guercino presents this riveting moment, when the woman grapples to understand Christ’s message that he is the living water, the source of eternal life. Born in the northern Italian town of Cento, near Bologna and Ferrara, Guercino (literally “squinter,” because he was cross-eyed) was largely self-taught. The painter Ludovico Carracci praised the young Guercino for his remarkable powers of invention: “He is a great draftsman and a terrific colorist. . . even the top painters are awestruck.” He won the patronage of Cardinal Alessandro Ludovisi, of Bologna, and Cardinal Jacopo Serra, of Ferrara. The Kimbell canvas was possibly painted for Ludovisi, who was later Pope Gregory XV. 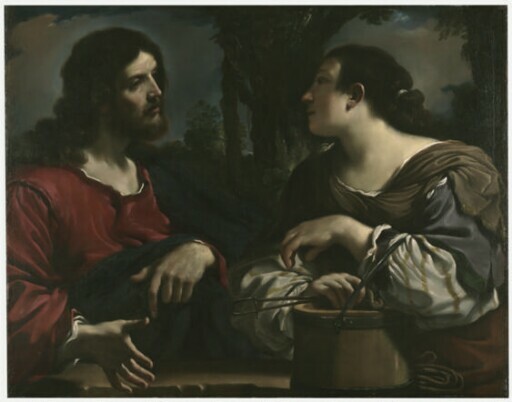 Guercino followed him to Rome in 1621 and painted influential works that had a great impact on Roman Baroque art. He soon returned to Cento and later moved to Bologna, where he maintained a prolific career, producing paintings for an international clientele, including King Charles I of England. purchased by Kimbell Art Foundation, Fort Worth, 2010.